Eight years later, after sticking together, the foursome have exceeded their business dreams. Most notably, they opened up the I Promise School in Akron, Ohio, over the summer. Today, Carter manages James’ business interests and is CEO of SpringHill Entertainment and its digital media platform that he and James created, UNINTERRUPTED. Mims is James’ chief of staff and is always by his side as he travels with the Los Angeles Lakers and for other business ventures. Paul, who was in the business of selling pro sports jerseys when he met a then-teenage James in Akron-Canton Airport, is now a notable NBA agent who represents not only James but also Anthony Davis, John Wall, Ben Simmons, Eric Bledsoe, J.R. Smith, Tristan Thompson and others. On Monday, ESPN will announce the debut of More Than an Athlete, starring James and his three close friends. The eight-part docuseries, which was produced by UNINTERRUPTED and will air on ESPN+, will follow their improbable journey from Akron to the global stage. “Watching my three brothers grow into serious businessmen with purpose fills me with so much pride,” James said in a statement to ESPN’s The Undefeated. “I watched as corporate America tried to look past or dismiss them. I always knew there was something special about Randy, Rich and Maverick and that, together, we were going to do something very different. I am so grateful and blessed that we found each other. And know my life would be very different without them. James will return to Cleveland on Wednesday for the first time as a member of the Los Angeles Lakers. Carter, Mims and Paul talked in-depth to The Undefeated about the upcoming ESPN+ series, their challenges and successes, and James’ move to the Lakers in the following Q&A compiled from separate phone conversations. 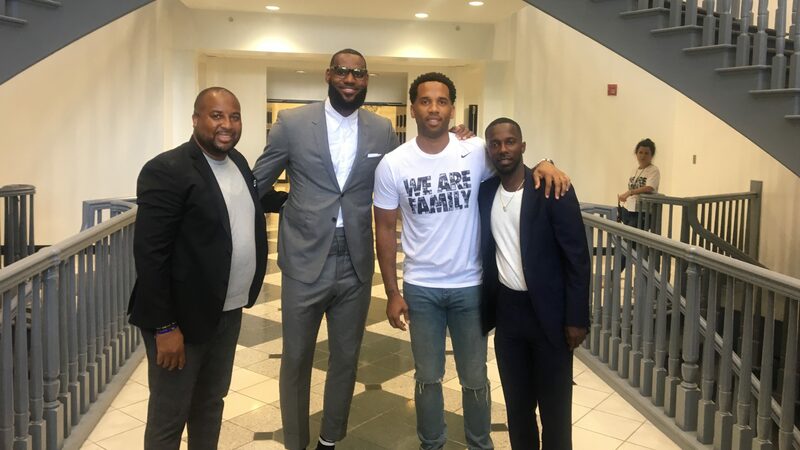 LeBron James (second left) and longtime friends (from left) Randy Mims, Maverick Carter and Rich Paul. What are you hoping viewers will gain from watching this docuseries? Randy Mims: The ultimate thing is never, never count yourself out. I always say that it would be very tough to be LeBron. But to be Maverick, Rich and Randy is very attainable. It just takes some hard work and, obviously, you have some type of product to be behind. We build off of each other, and we trust one another. Never let someone tell you what you can’t do. We found that out early. Everyone felt like we could not do this. And if we would have allowed that to happen, who knows where we would be? But we took that as fuel to push us forward. Rich Paul: What I’m hoping is, people understand that there’s more to it than just being somebody’s friend, or brother, or cousin. Anytime you plan to position yourself, you have to understand the sacrifices that come along with it, and the risks that you have to take, and the respect that you have to have, not only for the person who seems to be at that time the celebrity, or in this case the athlete, but for yourself as well. Maverick Carter: The main thing that they should understand is the role of LeBron as a platform and a guy who can empower a whole generation of people around the globe, and really give people a sense of being and a sense of you can do anything. He obviously gave it to the three of us. That’s what they should expect. Just seeing that LeBron, as I call him, is the human platform. He inspires and empowers a whole generation of people, not just in America but around the whole globe. What do you remember about the time you met LeBron? Mims: Three of us obviously are from Akron, Ohio, meaning me, LeBron and Maverick. I’ve known Maverick since he was probably 14, 15 years old. Maybe younger than that. He grew up down the street from my grandmother. I’ve known LeBron since he was about 4 or 5 years old through mutual friends, like a father figure to him was a very close friend of mine. And I met Rich along with everybody else at the same time, in the Akron-Canton Airport maybe 20-some years ago. The way we all kind of got together was during the time LeBron decided he was going to go on his own as far as representation. He was leaving his current representation and came together with all of us and said he wanted us to run his business for him. We’ve pretty much been together since then. Paul: I remember the day vividly. I just remember a kid that was very intrigued. He hadn’t really done, like, Sports Illustrated yet, but he was a good basketball player. I just remember a kid with his friends around him, traveling, just very intrigued. For them to approach me like, ‘What kind of jersey is that?’ And then for us to have a dialogue, and to be sitting here today, was just obviously God’s plan. But it allows you to understand exactly who he truly is, and that’s someone that’s not so caught up into himself. He doesn’t allow his ego to trump the things that made it necessary for him to ultimately be successful. Carter: We were teammates for one year, but I met him before we played in high school. It was my eighth birthday party, but I remember it from all the way back then. Yep. He was 5. My godmom actually, my mom’s best friend, and my mom were really close with his mom and his stepfather. Maverick, when did you first notice that LeBron could be a special basketball player? Carter: Like sixth or seventh grade. There was something special about him from the way that he thought things through, and how detailed and how much he paid attention to things. That is the same way he still is today. He’s very much the most detailed guy, and he uses his brain in a way I’ve never seen anyone be able to do. How did you guys come up with the nickname “The Four Horsemen”? We were just all in LeBron’s apartment during the holidays. Mav’s dad had bought us these hats and had us put these hats on. And we took a picture, and he was like, ‘The Four Horsemen.’ It just kind of came from there. We just ran with it. Mims: We could argue that. I could say I did. I think it collectively was a group effort. We brought some different things to the table, but I think it was pretty across the board we all agreed upon the name. Carter: It was collective. It was many nights up late at night talking, discussing ideas, plans, visions, what we thought could be. Randy, what does it say about LeBron that he had faith in you three friends to run all affairs? Mims: Ultimately, it’s a big sign of trust. The fact that he would want us to take over and run his large business means that he thought we were capable. We had to do our due diligence to put ourselves in line and learn and create relationships that would help us fulfill the dream that he had. Maverick, how did you guys know who should be in what role and what was that person’s strength? Carter: That came naturally. Randy just naturally fit as kind of LeBron’s chief of staff and helping him organize his life. My thing is what I always dreamed of and wanted to do. It took Rich a little time to figure out being an agent was the thing he wanted to do, but once he focused and got locked in on it, obviously he’s become a fantastic agent. Rich, how did you decide to become an NBA agent? [Former Cavaliers general manager] Chris Grant and [ex-Toronto Raptors and Philadelphia 76ers general manager) Bryan Colangelo told me very early on, ‘Rich, you would kill this. By yourself you would be cutting-edge.’ I’m like, ‘Really?’ … I didn’t understand it, but they had dealt with people for so long, and they saw things probably that people did well and didn’t do well, and the business changed. You used to be able to be an agent and sit up in your office and only see a guy for four years, and we accepted that. When I decided to be an agent, I focused on it full-fledged. I had my lumps, like we all do, because it’s not an easy business, and there were those people that wanted to kick me down and discredit me. You still got that today, so that will never stop, because it has so many effects. Randy, as someone that is around LeBron daily, what are the biggest challenges of your job? Mims: I’m very fortunate and grateful. There are a lot of sacrifices you have to make, obviously, especially with me being a family man with kids and household, looking after my parents to make sure they are straight because I am an only child. It brings its challenges. But part of the challenge is being able to balance all of that and still doing my job at a high level. Being around my other three partners, that gives me the drive because we all push each other to be at the top of our game, LeBron being the forefront. His drive makes you want to work harder and make sure that you’re always on top of your game. Maverick, what is your strongest attribute in the media, endorsement and marketing world? Carter: My biggest skill is my curiosity. I don’t really have many other talents except for I’m passionately curious. That was the thing that propelled my whole career and I use to this day to learn and listen and study and understand what I want to do. What is the proudest collective moment for “The Four Horsemen”? Mims: The school, I Promise School, in Akron. That was a really proud moment because three of us were part of Akron public schools, and all four of us were part of a public elementary school in Ohio. And to see and know what it takes to go to school and be a part of a school is one thing. But to be the person that, this is your school and you have something to do with it. To see those kids happy, those parents, the city, and be behind us. … And also, my friends, being the founder and owner so to speak, of the school, I thought from where we started, and to be here at a school, that was pretty impressive. Carter: We had a vision and a dream, and we’re still living it out. But we never thought what it could or couldn’t be. We just every day put the work in and kept going with the vision that we had. It’s become something that I never could imagine. How do you four collectively make it work? Paul: Communication, and then trust. In my business, a lot of times they don’t know who I’m recruiting or who I’ve landed until I tell them. They’re not privy to negotiations or anything like that, and they respect that for me, because it’s important. That’s just how I am with anything. With LeBron’s business, conversations were privy, but not every conversation. We allow us to be us. Just like I don’t know every conversation Mav has had on the television and content side, until he’s able to bring me up to speed on it at a certain time. As it pertains to Randy, that’s different. Because me being LeBron’s agent, and Maverick being LeBron’s business manager or business partner, we have to be privy on those accounts. What kind of role model do you think you four guys are for kids? Carter: We try to let all kids know that you, too, can do what you want and dream of if you put the work in and study and understand. Really, more importantly, be curious. Be extremely curious about the things you’re into and the things that you don’t know much about, to learn about them. How do you think LeBron’s move from the Cavaliers to the Lakers has worked out so far? Paul: Playing for the Lakers has been exactly what it should be, and that’s great for him and his family. Business for me, in every sector of the business, L.A. has become home base for. I got people that moved from New York to L.A., whether it’s the music industry, to fashion industry, sports industry, everyone has a turn like that. 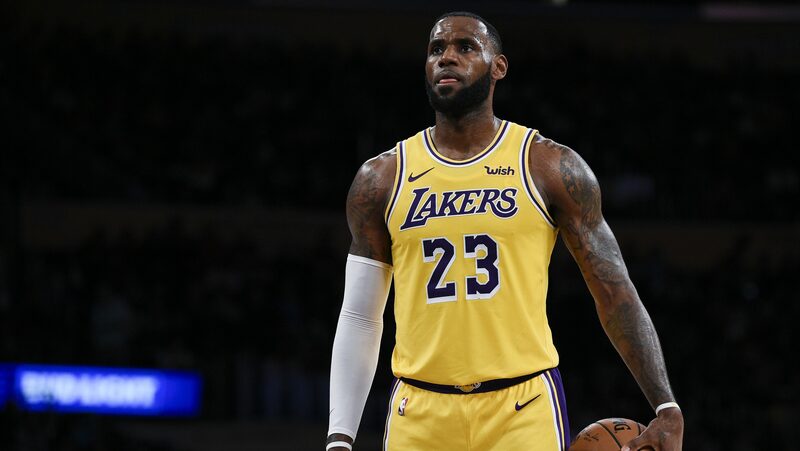 It kind of flip-flops between L.A. and New York, and now all that traffic is in L.A., which is great from a business perspective, but as far as the Lakers, I think that LeBron is ultimately happy. His kids are straight, and his wife is happy, so that’s great for him. Carter: It’s gone amazing for LeBron. He told me the other day that he thinks he has the greatest life in the world, so he’s enjoying it. He’s loving playing with the Lakers. I think the young guys have given him a renewed sense of energy. So I think it’s going fantastic.